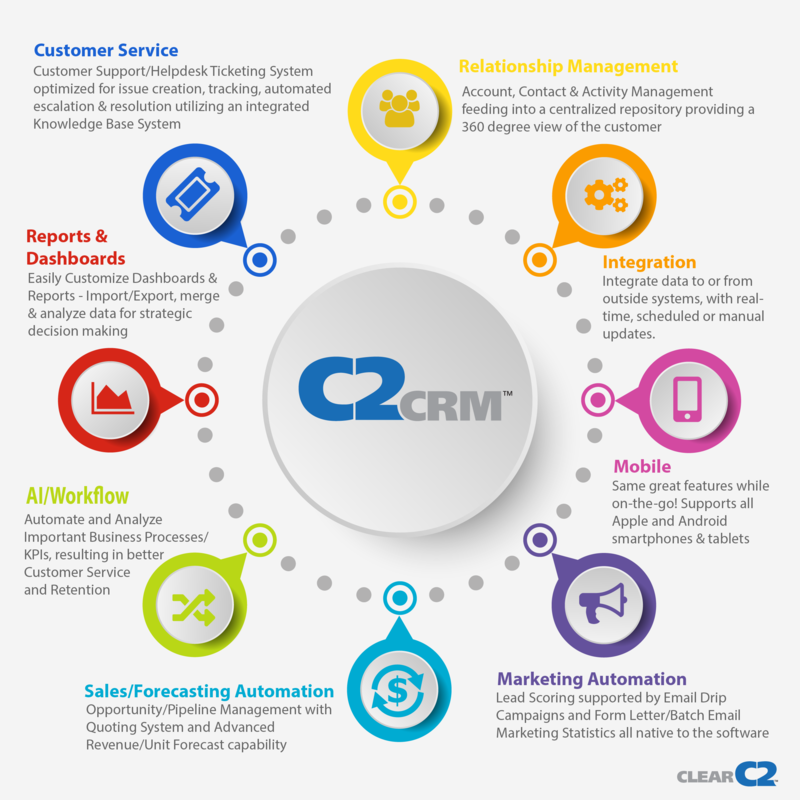 C2CRM streamlines your sales process by providing real-time information on leads, prospects and customers. It improves and tracks marketing initiatives. The C2 tool started out as a ticketing tool for our HR systems department years ago, but has been flexible enough to grow as we grow. C2 is now the tool we use for HR systems, Payroll, Accounts Payable, and our Talent Management team. C2 helps us manage requests from all across our organization, and never shies away from the challenges that we bring. The customer service, support, and creative partnership is also top notch! We are a VERY self sufficient organization, so having to rely on C2 service to execute some of our needs can slow us down, however as mentioned above, their service is always fast and friendly. C2 provides a centralized repository for all of our HR requests. It provides notifications as the requests moves through the process and when it is complete. C2 provides reporting and metrics that allow us to manage our customer relationships and measure our efficiency. The tool really is great and serves many purposes for our team. "I have worked with two different versions of this product daily in the last 6 years." Our company has over 30 users and this system is one in which we have the least number of problems. Typically if we have an issue with this tool, it is due to our network. Anytime we do need assistance from customer support, the issue is resolved quickly. C2 customer support is on top of everything we send in. If they can't resolve it right away, they will let us know when we can expect resolution. Sometimes our tickets will lock up because a user has sent in an image in the body of the email. Occasionally, we will have to have C2 support close these corrupt tickets. It would be nice if the system could support images that are in the body and not just an attachment. C2 allows our HR & Payroll groups to keep track of their work in one tool. Managers can monitor work load and progress as well. We also have the ability to go back and pull data when it is requested by employees in the organization or audit teams. The reports and queries also allow us to quickly locate history on an employee/payroll transaction. In addition, it keeps everything in one place so we can easily back up other team members or share ticket boxes when necessary. "Using C2CRM for customer and project tracking and for managing quotations association with projects." 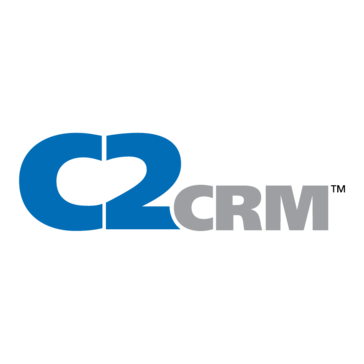 We use C2CRM as both a CRM tool and a quotation tool for our customer. While the software is very capable out of the box, we did a series of customization to make it better suited for our company. We use the tool thru 3 facilitys and as a way of working with our external partners is Asia. The C2 team was understanding of the changes that we needed to make and also suggest best practice based on their past experiences and in-depth knowledge of the tool. It would be nice to have the ability to customize reports without having to have them customer written. Other tools that I have used in the path, you can manage a report by first selecting the type of report and then by selecting the fields that you might need from different parts of the software. You can always ask for a custom report to be written, but it is hard to ask for customized reports for something that is a one off or infrequently used. The company uses C2 to maintain a database of all current and past customer that we have worked with. We use a customized feature of Opportunities to manage all the quotations for a specific program in one location so that we can review history, understand past volumes. We have reports that we can use to see how long a quotation is taking from start to finish, help to identify bottlenecks in the process and track our win/loss ratio. "Provides complete, concise picture of our customers and the tools needed to keep in touch with them." Working with the C2CRM team, we were able to quickly create a custom license tracking and secure software distribution system. We use the Form Letter, Communication & Workflow features included with C2 to automate responses to registration and support requests. In the 4 years since implementing C2CRM, the times we have had to call for support/training, they were very responsive, pleasant to work with and resolved items quickly. Not sure that there is anything that we dislike. It just works like we need it to. We are a small, distributed company with a rather complex business model of both consulting and software development. Before implementing C2CRM, it was extremely time consuming to access customer information from disparate systems to pull together a complete picture of our customer base. Using C2CRM, we can effectively track activity and send streamlined communications to customers from both sides of the company. The flexibility and communication from the staff at c2. Whenever there is an issue or a business need I feel confident that C2 has a solution. Years ago I was promised a Texas Rangers hat, I never received it. But it is ok, it has only been 10 years. We have been able to use C2 for many different reports, forecasting, quoting, and marketing email blasts. "It is our "Killer" App"
Ease of use. Support I receive and the ease of which I can customize the software to meet my company's needs. Not much. I have been a long time satisfied customer. This company offers the best support I have ever received across all vendors I work with. It is a true partnership. 5 stars! Sales Project Management, Marketing, Call Center Tech Support and other workflow processes. The CC2 development team have been very professional, have a can-do attitude under difficult conditions, and consistently go above and beyond to deliver on time. The work CC2 has provide for us has been highly custom, and allowed us to easily respond to changing business needs. Our team hasn't had any issues. I don't have any complaints with the quaility of work CC2 has provided our team. CC2 primarily builds the front end for our business application, however, CC2 has been flexible to provide additional services when requested. The application will serve approx 300-400 users involved in network troubleshooting and serves as a single pane of glass integrating multiple systems into a single UI. This reduces swivel chair and handle time for our employees. As a result te operating expense for our company has been reduced. CRCRM helps us keep current customer information in one spot, easily accessible to all users. The package allows us to tailor the displays and processes to match our unique requirements. C2 support is excellent - very responsive and they make sure your questions are fully answered. C2CRM is very flexible and can be tailored. Sometimes we find we've gone too far. Clear C2's industry knowledge and ability to design / develop solutions for our large network organizations. These solutions were developed with re-usability in mind, which is key when expanding to other work groups. There was nothing from my experience that I did not like regarding my experience with Clear C2, as they were always eager to work with us. Even if something did not go as planned, they quickly came up with solutions to any problems. Network Operations teams needed to visualize and consolidate all their work into one application. Utilizing Clear C2 as a partner developing "SPOG" (Single Pane of Glass) applications, has greatly reduced the "swivel chair" and length of time to troubleshoot network problems. "Best CRM in the industry"
Working with C2 to come up with creative solutions to creative needs. Honestly, nothing comes to mind. Big fan for many years. Will make a positive impact on your management of customers. Project Management. Special offers. Survey eCasts. "C2CRM makes my job easier!" C2 is so easy to use. It organizes my day from contact details to sales and marketing. I would like the ability to to import my own contacts instead of asking our internal admin...but that may be how our security is set up. We have workflows set up to make sure our biz processes are all automated. So I always have real-time info (in the office or in the field on my cell). It also reminds me if/when I haven't communicated with a key customer in a certain amount of time. I am also able to personalize emails and track who reads them and if they click a link! That's super cool. "C2 - Great Experience & Pleasure doing business with"
The best thing about C2 is their people. The willingness to go above and beyond is fantastic. It is almost like an extension of our workforce without being employees. I don't have much to dislike about C2. If there is one thing is possibly having more resources to throw at projects. Sometimes it feels there is a resource being shared throughout multiple projects. C2 has helped us with multiple SPOG (Single Pane Of Glass) applications we have developed utilizing REACT. They're knowledge in this area has been extremely important in order for our organization to achieve our goals. "Great Product can be software or hardware "
It's 100 percent web-based. It automates workflow. It has two mail. It is reliable. It's a great product for your company. It integrates with back office applications. C2's ability to custom the application to my requirements. Latest version doesn't have the admin features programmed yet. Organizing data better. Entering all information into one spot and analyzing the data with reports. * We monitor all C2CRM reviews to prevent fraudulent reviews and keep review quality high. We do not post reviews by company employees or direct competitors. Validated reviews require the user to submit a screenshot of the product containing their user ID, in order to verify a user is an actual user of the product. Hi there! 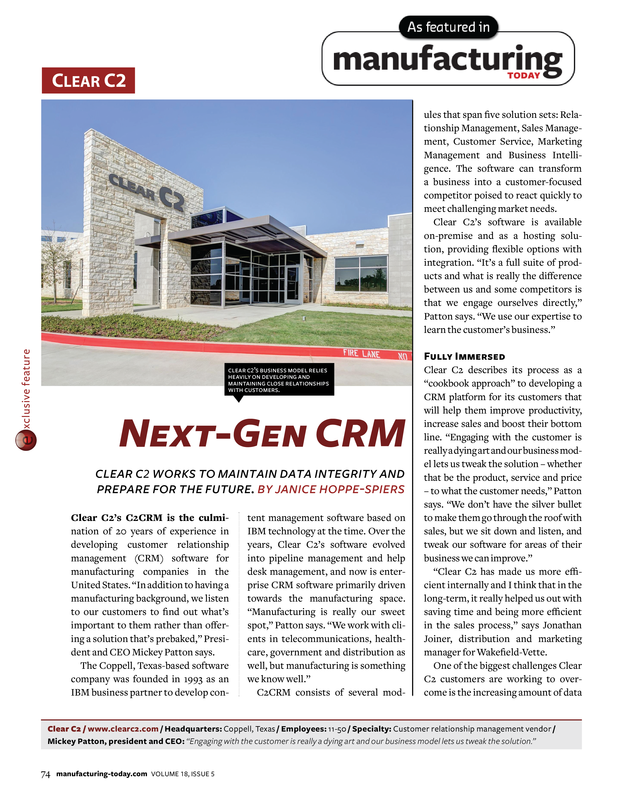 Are you looking to implement a solution like C2CRM?